Netflix - After a brutal virus wipes out most of the population, two young siblings embark on a perilous search for safety - and answers. 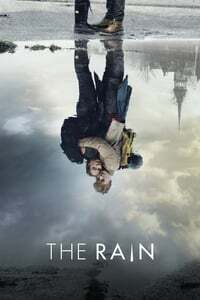 The Rain is a Danish post-apocalyptic web television series created by Jannik Tai Mosholt, Esben Toft Jacobsen and Christian Potalivo. IMDB: "The world as we know it has ended. Six years after a brutal virus carried by the rain wiped out almost all humans in Scandinavia, two Danish siblings emerge from the safety of their bunker to find all remnants of civilization gone. Soon they join a group of young survivors and together set out on a danger-filled quest through abandoned Scandinavia, searching for any sign of life. Set free from their collective past and societal rules the group has the freedom to be who they want to be. In their struggle for survival, they discover that even in a post-apocalyptic world there's still love, jealousy, coming of age, and many of the problems they thought they'd left behind with the disappearance of the world they once knew." Vulture review: The Rain may be Netflix’s first Danish original series, but its premise will look somewhat familiar to anyone who watches The Walking Dead. No, The Rain does not contain any zombies. But within the first ten minutes, it becomes obvious that it will be another post-apocalyptic drama about a virus that devastates humanity, leaving precious few people behind to figure out how to scrap their way toward continued survival. If you’re into that sort of thing, it will grab your attention right away and, based on the initial three episodes made available to critics — most likely hold on to it. But if you’re at all fatigued of dramas about the demise of humanity, you may find it hard to soldier through, especially if you try to swallow all eight episodes in a sitting or two. I really enjoyed this one. I thought it was well done and the actors were pretty good. It's been a while since I watched though. I tried this when it first appeared a few months ago as I do enjoy a good post-apocalyptic tale but I didn't even get to the end of the first episode. Without spoiling there is a fairly major plot moment where kids are told not to do X, Mum turns back to make a cup of tea and the kids literally get up and do X, Mum doesn't notice for 30 crucial seconds and bad things happen. It just seemed such a lazy, obvious thing to do, it didn't inspire me to stick with it, although maybe I should jump straight into the bit where they leave the bunker 6 years down the line and see how I get on.